Back in 2015, Dean started writing about movie churches and the clergy who served in them. At first, he posted at Dean and Mindy go to church, but after only a few months, he started this blog. Oscar season seems like a good time to move those old posts here, where they really belong. A cinematic bomb is usually not a cause for celebration. 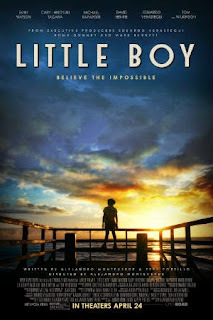 An atomic bomb killing tens of thousands of people is an even more unlikely cause of celebration, except in the cinematic bomb that is Little Boy. Perhaps that's a little unfair. But the film cost $20 million and looks unlikely to recoup its costs anytime soon. And as for the atomic bomb celebration -- well, let's talk about that later, because really, we're here to discuss churches, and there is a church in this movie along with a couple of priests. So we're in business. I guess I should first let you know what the film is about. Pepper (abnormally diminutive, thus the nickname, "Little Boy," which is also a title drop), is growing up in a small California coastal town during World War II. Pepper and his father are big fans of a comic superhero "Ben English, Magician," and after his father leaves with the army to fight in the Pacific theater, Pepper believes he possesses similar magical powers that can bring his father home. When he hears a sermon at his local Catholic church about the faith of a mustard seed moving a mountain, Pepper takes it to heart. The priest is put off by Pepper equating the faith Jesus was talking about with a comic book character's magic powers, but another priest, Father Oliver (played by Tom Wilkerson), takes interest in Pepper's mission. The priest adds one more: "Befriend Hashimoto." Hashimoto is a Japanese man in town, recently released from an internment camp. Pepper has learned from his brother that he should hate the Japanese that are fighting his father, so he sees this as the most difficult of the assignments. I'm frankly undecided about whether Father Oliver is wise in presenting the list to Pepper. Most of it is simply the teaching of Jesus, which obviously a priest should provide for his people. But he allows the boy to look at the list as good works that will force God's hand, or even worse, works that will give Pepper special powers to change the world through his own will. Though "Befriend Hashimoto" isn't to be found in Scripture, Jesus did teach, "Love your enemy;" it seems a good contextualization of the command. The priest himself has befriended the Japanese man, who has been ostracized by most of the community. Pepper eventually becomes very good friends with the old man. Pepper probably profits from considering how to fulfill the assignments on the list. Most Christians could give more thought and action to fulfilling the teaching of Matthew 25, to provide for the needy. The one strange thing on the list is the assignment to "Bury the Dead," which is not found in Matthew 25. In fact, Jesus said in Luke 9:60, "Let the dead bury their own dead, but you go and proclaim the kingdom of God." This seems to be added as a plot point to present Pepper with a dilemma that doesn't really involve Pepper's decision making at all. All in all, I'd commend the work of Father Oliver and give thumbs up to his movie church. He can't help it if Pepper proves to be a bit of a megalomaniac. As for the mention above about the celebration of an atomic bomb -- though it has little to do with the movie church in the film, this is the thing the film will probably be remembered for. 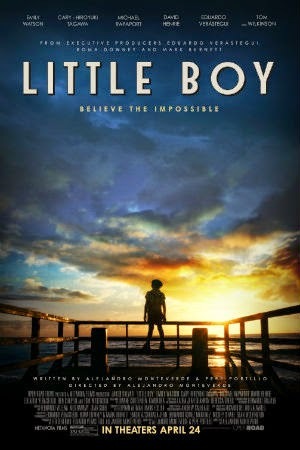 Historians among you probably realize that "Little Boy" is not only a mean nickname for the young boy in this film, but also the name of the bomb dropped on Hiroshima. Pepper has taken to pointing his hands toward Japan and grunting and wishing in hope of ending the war. Everyone in town notices this strange behavior. But when the newspapers report that the bomb named "Little Boy" has killed tens of thousands of people, everyone in town celebrates. They lift Pepper on their shoulders and shout with joy. It's understandable at the time why the devastation of a Japanese city would be treated with such festivity. But to see it now on film makes one feel more than queasy, especially in a film targeted toward people of faith. It's too bad, because the message of loving your enemy comes out clearly in much of the rest of the film. Sometimes it seems that to make a great film about faith would be a true miracle. European Vacation II: Boo-worthy or Award-worthy?